Is in the news again ! VALENTINA CIRASOLA is an Italian born designer and an expatriate to USA. Her career started as a Fashion Designer in Italy. After long years in fashion and one more university degree in interior, she turned to Interior Designing. She has been a designer for 16 years straight so far, now serving the people in the Bay Area of California helping them building the castle of their dreams. Stone Fabricator: Clervi Marble Co. I was contracted to design a kitchen for a new client. During the interview with them, I noticed that the kitchen ceiling was too low for them, the clients were very tall people. The new kitchen concept I designed and presented to them included a raised ceiling, which they heartily agreed to and construction began. 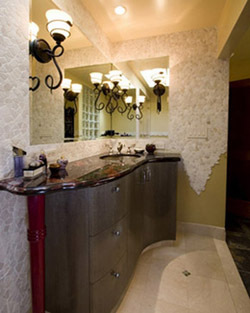 Clients were so encouraged with the progress that they decided to remodel their two bathrooms as well. The desire of the lady of the house was not merge the two bathrooms into a huge, cold master bath, but to make the two baths a bit larger, keeping them separate, one for her and one for her husband. These two rooms were outdated, dingy and tiny. The hard surfaces for both baths were purchased at Pietrafina Marble, therefore I will only elaborate on the bath designs. In the two baths, skylights were added and new lighting system was designed. To make the bathrooms bigger, I had to take space from the adjacent library and the atrium. (The smaller atrium later became the music room.). Ultimately they asked me to redesign the entire home, but that is a story for another time. Looking around the house, I realized that it was filled with beautiful, curvy and shapely antique furniture and that whimsical, playful motifs were popping out to surprise the viewer. My intent was to follow her style and to create attractive and functional furniture pieces for the two bathrooms more than building the usual shoe box cabinetry. The gentleman’s bathroom was rearranged totally with my new space planning. I designed the gray curvilinear piece of furniture to fill beautifully one of the corner, leaving more floor space to the rest of the bathroom. The counter slab, purchased at Pietrafina was Iron Red a stunning natural formation of iron and copper quarried in Brazil. It sits on top of a cabinet made of Hare Wood, a type of wood native of England. The wrought iron lights, set onto the mirror, are the perfect combination with the slab. The fabrication of this exotic piece of furniture was done by an Italian Master Ebonist Giuseppe D’Ambra in his South San Francisco shoppe. 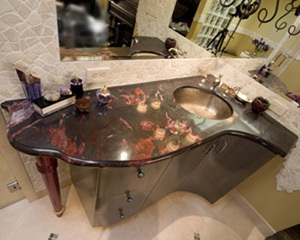 The fabrication of the Iron Red stone counter was executed by Clervi a stone fabricator in San Francisco. The lady’s bath took on a different look because she wanted a tub.I envisioned a Roman-style bath where she could take leisurely, long and pampering baths. We purchased the marvelous Giallo di Siena Marble at Pietrafina Marble that set the tone for the whole design. The translucency of this traditional marble gives the striking effect of back lighting. 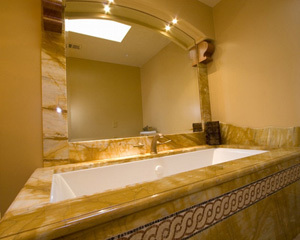 The Jacuzzi tub surroundings and the diagonal line backsplash were made entirely of Giallo di Siena Marble with an inset of the typical Roman design scrolls made of tumbled marble mosaics. To give a framing detail to the tub, I set a large mirror into a thick frame of Giallo di Siena Marble, enclosed by an alcove with lights and two decorative Honduras Mahogany corbels at each side of the mirror. The effect is relaxing, warm and luxurious. A spa at home was born! 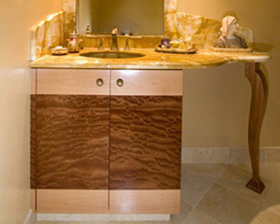 The vanity cabinet follows the same look of the tub. The slab counter of the tub was repeated on the vanity in Giallo di Siena Marble, the backsplash and mirror continued the design of the tub. The Giallo di Siena Marble sits atop of my the extravagant designed cabinet made of Pomele Sapele Wood. Two beautiful pendent lights at each side of the mirror set the warm glow of the ambiance mood. The floor is 16×16 Jerusalem Gold tiles. The wood cabinet of the lady’s bath was also fabricated by Giuseppe D’Ambra and the marble was fabricated by Clervi Marble Company.